Mostly everyone is familiar with the benefits of orthodontic treatment. If you’re struggling with teeth that are spaced too far apart or noticeably misaligned, it can help you achieve your best smile at last. However, many patients (mostly adults) struggle with the image of traditional braces – is it really worth it to have to wear those unnatural wires and brackets for years on end? At Advanced Dental Concepts, our doctors are happy to offer a much more aesthetically pleasing alternative to this age-old option: Invisalign. If you’re ready to schedule a consultation here in Crown Point, don’t hesitate to contact us! 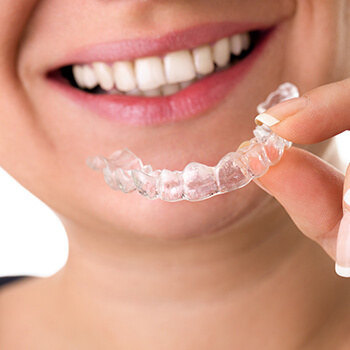 Instead of the traditional model, Invisalign provides patients with a set of clear aligners that have been designed to fit their unique smile. Each aligner represents a different stage of treatment – as your teeth gradually shift into their desired position, the aligners are rotated out again and again, which each one being worn a few weeks on average. During this time, you’ll also need to attend brief check-ups with our team so that we can check up on your progress and make sure everything’s going smoothly. The clear nature of the aligners makes them very subtle when worn. This means that people will be looking at YOU throughout treatment, not at your braces. The aligners are also removable, allowing patients to take them out when eating a meal or brushing/flossing for maximum convenience. Do you have a big event coming up that you want to look your very best for? There’s no problem with taking out the aligners for a couple of hours, just as long as you remember to pop them back in when you’re finished. On average, treatment with Invisalign is complete within 8-18 months. This is a significant improvement over many cases with traditional braces, which often can require multiple years of your time.